In conjunction with other sensory inputs, such as vision and proprioception, information from the vestibular system coordinates movement between the eyes and head and provides important information about postural orientation. The peripheral vestibular system consists of a bony and membranous labyrinth. 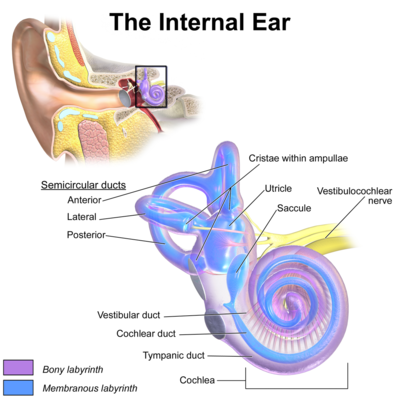 The bony labyrinth forms 3 semicircular canals, the cochlea, and an ovaluar chamber called the vestibule. This bony shell is filled with perilymphatic fluid that suspends a membranous labyrinth within it. The membranous labyrinth contains 5 sensory organs: 3 semicircular ducts and 2 otolith organs known as the saccule and utricle. All are filled with endolymph, a liquid whose composition is similar to intracellular fluid. The semicircular ducts are three, orthogonal rings encased within the semicircular canals. They are responsible for detecting head rotation. The ducts are named in accordance with their location and the direction in which they are optimized to register rotary movement: anterior (also: superior), posterior (also: inferior), and lateral (also: horizontal). The anterior and posterior canals are oriented 45 degrees lateral to the sagittal plane, such that the posterior and anterior canals on opposite sides of the body are aligned in the same direction. The lateral canal is pitched 30 degrees up from the horizontal plane. Each ring has two ends that terminate at the utricle located centrally. Within each set of end points, the base of one has a widening known as the ampulla. The otolith organs are located in the vestibule. They take the form of two sacs that detect linear acceleration of the head. The utricle is responsible for sensing horizontal movement (i.e. forward-backward and left-right movement), while the saccule serves to detect movement in the sagittal plane (i.e. up-down movement). The semicircular ducts and otolith organs contain a unique set of sensory epithelium and hair cells. These cells function to convert information about head acceleration into neurologic signals that are later processed by the central vestibular system. The sensory epithelium of the semicircular ducts is known as the crista ampullaris and is located within the ampullae. The corresponding tissue within the utricle and saccule is known as the macula and is located on the floor and medial wall of each organ, respectively. In both cases, sensory epithelium support a set of hair cells that function as mechanoreceptors. Each hair cell consists of 70-100 processes called stereocilia. The stereocilia form rows that start short and progressively increase in length until reaching the kinocilium, a large single process that serves as a reference point for cell excitation or inhibition. When head movement bends the stereocilia towards the kinocilium, excitatory potentials to vestibular nerve fibers increase. The bending of stereocilia away from the kinocilium reduces input to corresponding vestibular nerve fibers. Within the ampullae, a thick gelatinous substance called the cupula overlies the crista. The processes from hair cell receptors project into the cupula, bending in response to pressure differentials across the weighted membrane. The macula of the utricle and saccule is also covered in a gelatinous membrane, but, unlike the cupula, contains calcium carbonate crystals called otoconia. These crystals play an important role in bending hair cells (and therefore, detecting linear acceleration) through inertial drag and shearing. The anterior and posterior vestibular artery provide blood to the peripheral vestibular apparatus. The utricle, superior semicircular duct, horizontal semicircular duct, and a small part of the saccule are supplied by the anterior vestibular artery. 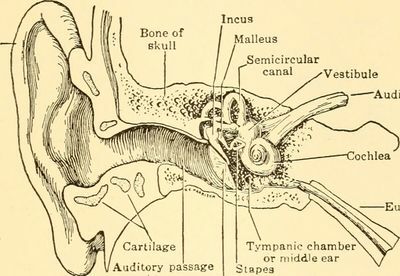 The posterior semicircular duct, the saccule, and a small part of the utricle are supplied by the posterior vestibular artery. 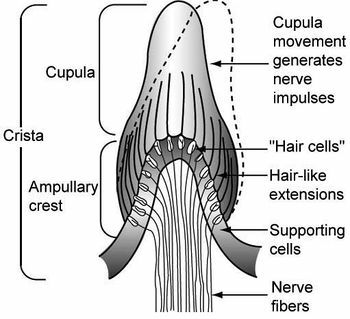 Afferent impulses generated by the hair cells of the crista ampullaris and the maculae are are innervated by the vestibular nerve. First, impulses must pass through the vestibular (Scarpa's) ganglion. The vestibular ganglion is divided into two parts: the superior and inferior division. The fibers of the superior division innervate the utricle, as well as the anterior and horizontal semicircular ducts. The fibers of the inferior division innervate the saccule and the posterior semicircular duct. Axons from the divisions of the vestibular ganglion merge to form the vestibular nerve. The vestibular nerve combines with the cochlear nerve to become the vestibulocochlear nerve. This nerve crosses the temporal bone and enters the brainstem at the level of the pontomedullary junction. Here, the vestibular and cochlear nerve separate, with the majority of the vestibular nerve fibers terminating at the vestibular nuclei. The vestibular nuclei are the main processors of vestibular input. In addition to vestibular afferents, they receive and integrate information about vision, hearing, proprioception, and touch. In total, there are four nuclei which are named based on their location within the pons: superior, inferior, medial, and lateral. 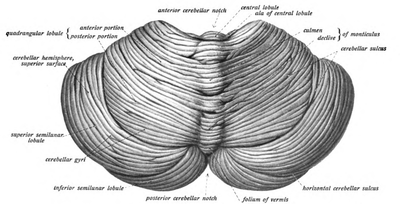 For the vestibular nerve fibers that don't project to the vestibular nuclei, the remainder go to the cerebellum. In particular, the vestibulocerebellum (the flocconodular lobe and the vermian cortex) monitors vestibular performance and makes adjustments to central processing if necessary. For example, the vestibulocerebellum has the ability to fine tune the response of postural reflexes and the ocular gain associated with the vestibuloocular reflex (VOR) [see section on 'Motor Outputs' for more details]. Vestibular pathways primarily act on muscles of the eye and those that maintain posture and balance. For example, the vestibuloocular reflex (VOR) is responsible for gaze stabilization during short and fast rotational head movements. When the head turns, vestibular output to the extraocular muscles signals conjugate eye movement in the equal and opposite direction. The result is a stable visual image, despite changes in head orientation. The vestibulospinal reflex (VSR) stabilizes the body in response to stimuli that alter equilibrium. Among others, inputs from the medial and lateral vestibular tract are used to signal muscles of the head, limbs, and trunk in a way that counteracts destabilising forces (ex. extension of the head, limbs and trunk in an attempt to maintain upright posture and balance after being pushed). Vestibular dysfunction is often accompanied by symptoms such as vertigo, dizziness, tinnitus, nausea/vomiting, and hearing loss. These symptoms, and associated losses in vestibular function, can result in impaired balance, falls, depression, anxiety, disruption of work/daily activities of living, and disability. Vestibular rehabilitation therapy has been shown effective for treating a variety of vestibular conditions that can be implemented by physical therapist professionals. Therefore, it is important for physical therapists to be trained in how to identify, treat, and when necessary, refer patients with known or suspected vestibular dysfunction. ↑ 1.0 1.1 1.2 1.3 1.4 1.5 Hain TC & Helminski J. Anatomy and Physiology of the Normal Vestibular System. In: Herdman S. Vestibular Rehabilitation, 3rd edition. Philadelphia: F.A Davis Company; 2007. p. 1-18. ↑ 2.00 2.01 2.02 2.03 2.04 2.05 2.06 2.07 2.08 2.09 2.10 2.11 2.12 2.13 2.14 Khan S, Chang R. Anatomy of the vestibular system: a review. NeuroRehabilitation. 2013 Jan 1;32(3):437-43. ↑ Thompson TL, Amedee R. Vertigo: a review of common peripheral and central vestibular disorders. The Ochsner Journal. 2009 Mar;9(1):20-6. ↑ Agrawal Y, Ward BK, Minor LB. Vestibular dysfunction: prevalence, impact and need for targeted treatment. Journal of vestibular research: equilibrium & orientation. 2013;23(3):113. ↑ Han BI, Song HS, Kim JS. Vestibular rehabilitation therapy: review of indications, mechanisms, and key exercises. Journal of Clinical Neurology. 2011 Dec 1;7(4):184-96.